Bhutan or ‘Druk Yul’ – the mythical Land of Peaceful Dragon is as much known for its dramatic land architecture and fabulous bio-diversity as for its rich and colourful cultural heritage. The land of the thunder dragon kingdom is a traveller’s paradise and an environmentalist’s dream. Bhutan, best known to the world as the last Shangri-La has a rare combination of harmony and accord amidst a landscape of incredible beauty. The location of Bhutan, nestled between Tibet, Nepal and India, assures the Bhutan tourist of fascinating cultural discovery, while Bhutan geography, in the mighty Himalayas, promises spectacular natural vistas. Plenty of travellers want to explore the breathtaking mountains and valleys of this astonishing country. The tourism industry in Bhutan is founded on the principle of sustainability, meaning it must be environmentally friendly, socially and culturally acceptable and economically viable. Bhutanese have treasured the natural environment and have looked upon it as the source of all life. More than 70 per cent of the land of Bhutan is still under the forest cover and with its rich Himalayan flora and fauna, dazzling white peaks and lush valleys provide Bhutan’s stunning beauty and aesthetic grandeur. This bio-diverse location is home to red pandas and tigers, rare Takin and langur, blue sheep and snow leopard in the northern mountains and the south offers wonderful birding and a wealth of rare plants and herbs. More than a quarter of the country has been preserved for national parks and sanctuaries. The country ranges from the dense forest of subtropical forest to the alpine shrubs, with a many different of flora and fauna. The Kingdom of Bhutan has adopted a cautious approach to tourism to avoid any negative impact on the country’s culture and environment. 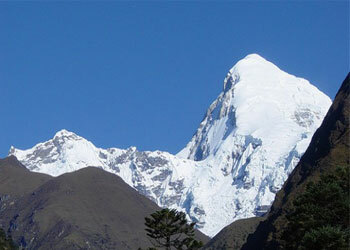 Bhutan offers many opportunities for travellers with its high mountains deep valleys and untouched by modernization. Trekking in this mountain of Bhutan is a wonderful experience for anyone who enjoys hiking and camping in a rich natural forest, meeting with the local people/yak and their traditional cultures. It was in the 8th century AD that Guru Padma Sambhava introduced Buddhism to the country. The dominant sect that came to be established in the country was the Drukpa Kargyu sect of Mahayana Buddhism, which is now the official religion of Bhutan. This ethnic diversity of the people has resulted in numerous dialects and languages that are spoken throughout the country. Dzongkha is the National language. Bhutan cultural tour may showcase the country’s magnificent architecture and arts and crafts which form a significant part of the Bhutanese identity. The architecture is striking especially so when you learn neither blueprints nor nails are used in construction. State buildings and homes alike have distinctive white mud walls supported by heavy timber frames and punctuated with arched trefoil windows. The wooden beams are painted with elaborate symbolic earth-toned designs. Dzongs (fortresses), Lhakhangs (temples), Gompas (monasteries), Chortens/Stupas (religious monuments) and houses all reflect this special architecture. Bhutan’s climate ranges from tropical in the south, to temperate in the centre of the country, too cold in the north and like much of your adventure in the Himalayas it will be quite unpredictable. Mid-December to early January can be a beautifully clear and dry time in Western Bhutan. Late December through mid-February is the period of heaviest snowfall in the higher elevations. Spring season remains sunny for most of the time but still morning and evening turns bit chilly where you require wearing warm clothes. Summer season is very warm in Bhutan. Bhutan is full of magical legends, breathtaking scenery, unspoiled land, uniquely crafted architecture and probably the most gentle people on earth. If you do visit Bhutan, you will become one of the few who has experienced the charm and magic of one of the world’s most enigmatic countries and you’ll be playing your part in this medieval kingdom’s efforts to join the modern world, while steadfastly maintaining its distinct and amazing cultural identity.